The Education Building was built in 1997 with Funds from the Minnesota legislature, and furnished with a generous grant from the Schmidt Foundation. The building may be rented for meetings or events for $100 per day. 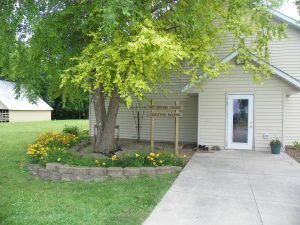 Members of the Ney Nature Center receive a $10.00 discount when renting the building. The Education Building is equipped with bathrooms, a drinking fountain, kitchen area, tables and chairs for up to 100 people, nature and history displays, and projector screen. To reserve the building, please call the Ney Nature Center’s Office at (507) 357-8580 or use our Contact Form. Please download, fill-out and mail back to the Ney Nature Center our Building Use Form after you have called the Ney Nature Center (507-357-8580) and confirmed the date and time. There are parking facilities at the Education Building and the Ney Homestead site, which include handicap accessible spaces. The parking lots and park entrance have gravel surfaces. Additional farm buildings on the site are locked and are used for storage or appropriate classes such as bird house and snowshoe construction. If you wish to arrange the use of one of these buildings, call the Ney Nature Center’s Office at (507) 357-8580. Education, conservation, civic, governmental, non-profit and youth organizations will be charged $25.00 for full or half day. Building use for all other reasons will be charged $100.00 for Fridays, Saturdays and Sundays and full days during the week, which includes evening use. Members of the Ney Nature Center receive a $10.00 discount when renting the building. $15.00 for use of the campfire ring. Firewood is provided. Collecting firewood is not permitted. Large events, tents, and overnights will be handled on a case-by-case basis at the discretion of the NNC Board of Directors. Reservations for building use can be made by calling the Ney Nature Center’s Office at (507) 357-8580, ideally one week in advance. A Damage Deposit of $50.00 for Large Event building use is required at time of building use application submission. Deposit will be returned upon approval of building and grounds condition. Building rental fee must be paid at time of reservation (payable to the Ney Nature Center) to help cover utility/cleaning costs. Large events need to be scheduled Three (3) months in advance to allow for NNC Board of Directors approval. Building is secured by an alarm system during non-park hours. The users of the facilities will be expected to clean up after themselves and to secure the facilities as listed in our “After Building Use Checklist” that can be found at the end of this form. The deposit will be returned if all aspects of the checklist are complete in a satisfactory manner as determined by the Ney Nature Center staff. Food, with the exception of beverages, may not be prepared at the Ney Nature Center; however, food that has been prepared elsewhere may be served on-site. Beer kegs and glass bottles are not allowed (In event situations, special permission can be obtained. Contact the office with questions and requests). Alcohol is permitted if served in cans or plastic cups. Please recycle. If tobacco will be used at an event, please provide your guests with proper waste receptacles to keep the grounds clean. Firearms are not permitted on the premises. Open fires are permitted only in the fire ring that is located in front of the Education Building when scheduled with Building Use. Firewood will be provided with an additional cost of $15. Collecting firewood is not permitted. Users of the facilities are responsible for reimbursing the Ney Nature Center for damaged or lost property and unreturned key. Alarm system: The Education Building alarm shuts off at 7:00 a.m. and arms itself at 10:00 p.m. so we ask that those times be respected for being out of the building. Anyone who fails to abide by the established rules or causes damage to property will not receive their deposit back and will be prohibited from future use of the facilities.